Step aboard the S/V Mandalay at 5 PM, Sunday, July 7th, in St. George’s, Grenada and get ready to depart on a 7-day, 6-night sail through the Grenadines. We will visit a selection of islands which may include Grenada, Carriacou, Union Island, Mayreau, Tobago Cays, Bequia and possibly other stops along the way. 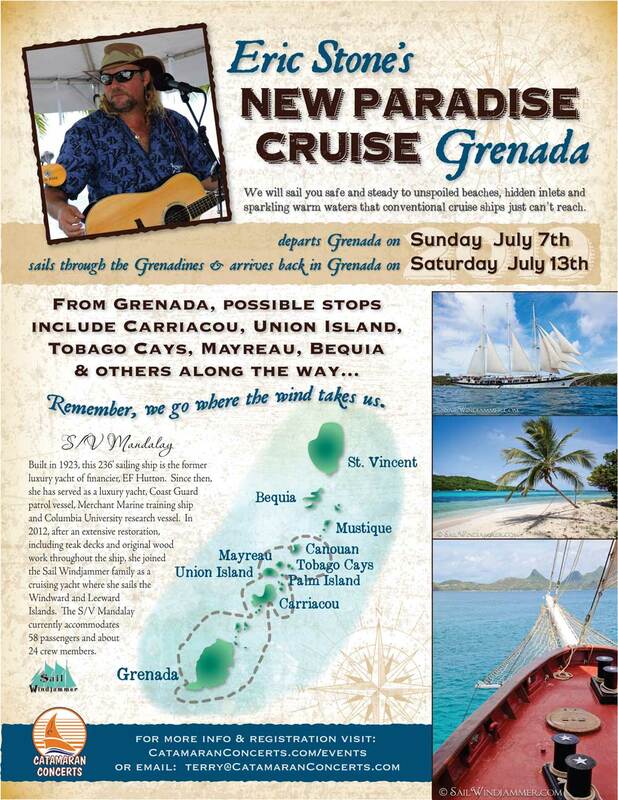 We disembark at 10 AM, Sunday, July 13th where we began, in St. George’s, Grenada. Since this is our ship, we actually get to pick where we want to go and how long we want to stay. You can’t do that on any other cruise. Purchase Tickets for Grenada Now! The S/V Mandalay provides a laid-back experience with comfortable air-conditioned cabins and 110 volt power. Each cabin is an ensuite in itself with your own private bathroom, shower, ample wardrobe space, steward service and many other important comforts. Built in 1923, this 236’ sailing ship is the former luxury yacht of financier, EF Hutton. Since then, she has served as a luxury yacht, Coast Guard patrol vessel, Merchant Marine training ship, and Columbia University research vessel. In 2012, after an extensive restoration, including teak decks and original woodwork throughout the ship, she joined the Sail Windjammer family as a cruising yacht where she sails the Windward and Leeward Islands. The S/V Mandalay currently accommodates 58 passengers and about 24 crew. Please note the cabin layout pictured above is not to scale and there may be some slight variations in cabins from what is shown in the pictures below. Standard Cabin, #7, 8, 9, 10, 15, 16, 18, 19, 26, 31, 32, 33 & 34. The Standard Cabin is a Lower Deck cabin and feature a bunk bed, private bathroom/shower and porthole window. Large Standard Cabin, #20, 21, 22, 23 & 24. The Large Standard Cabin is a Lower Deck cabin and features a double bottom bunk bed, private bathroom/shower and porthole window. (Double bottom bunk is not shown). Commodore Deluxe, #11, 12, 13 & 14. The Commodore Deluxe is an even larger Lower Deck cabin and features a lower full double bunk, private bathroom with separate shower and porthole window. Admiral’s Suite, #1, 2, 3, 4, 5 & 6. The Admiral’s Suite is located on the Main Deck and features a large cabin a double lower bunk and upper Pullman, private bathroom and shower and window with a great view. The King’s Cabin is located on the Lower Deck, is double the size of a Standard Cabin and is the largest cabin available. It features a 6’9”x 5’8” bed, private bathroom, separate shower and porthole window. Port Charges, Entertainment Fee, early morning pastries and Bloody Mary’s, three sit down meals per day, early evening snacks and Rum Swizzles, 24 hour coffee, tea and water, entry into all the deck games and masquerade party. Airfare, hotels, ground transfers to/from the airport-hotel-ship, tours, shore excursions, snorkel gear rental, alcohol from bar, ship’s store items and travel insurance. Pastries, Bloody Mary, coffee and tea are available for early risers. Hang out on the top deck and watch the sunrise. It’s a great way to start the day. View marine life and birds while enjoying your coffee, Bloody Mary and sticky buns. Full service breakfast served in the Dining Room. The day begins with the legendary greeting, “Good Morning Captain Sir!” Listen to the Captain as he delivers an entertaining overview of the islands and the day’s activities. Local lore, history, jokes and tall tales are all part of the fun. Almost every island we visit offers beach and water sport activities, including snorkeling and even swimming from the ship. If we’re anchored off a deserted island, grab your beach towel, sunscreen, a good book, your favorite floatie and head for the beach. You can choose from various Island Shore Excursions each day. Some last a few hours, some a full day (with lunch included). If you choose to, you can just relax on the top deck, read a book with a drink in hand and enjoy the solitude. Be prepared to enjoy the music of Eric Stone performing at a few locations also. Lunch is served in the Dining Room or ashore on the beach. 5:00 PM to 5:30 PM, Snacks and Rum Swizzle Time. Enjoy a refreshing rum swizzle and an assortment of tasty goodies ranging from local seafood to peanut butter pate and mingle with your fellow passengers. You can either relax on the top deck and watch the sun begin to set and try to catch a glimpse of the green flash or participate in our whacky deck games. You can also try your hand in the age old custom of blowing conch shells at sunset. Bring your favorite conch shell or use one on the ship. Don’t know how to blow a conch shell? We have a local expert onboard to teach you. You’ll have your choice of a couple of delicious entrees served by the amazing, friendly and charming crew. Dinner can be a buffet, sit down or even prepared ashore. Many choices here, listen to Eric Stone and dance the night away, mingle with your new friends at the rail, relax with your beverage of choice on the aft deck or grab a floatie and gaze at the stars. If you’re worn out from the day’s activities, retire to your cabin and enjoy the tranquil nights at sea. There are also nightly games and activities including our Mandalay Masquerade Party. Bring a costume if you like or use one that is onboard. Remember, the bar remains open as long as someone is buying drinks. The meals aboard the Mandalay are what would be described as typical Caribbean Cuisine. However if you have special dietary requirements, just let us know and the crew will prepare a special meal for you. Do you have a favorite cocktail or beer you prefer? No Problem, just let us know and we will stock it aboard the ship. A valid passport and return ticket is required for all visitors. Your passport must be valid at least 6 months after your planned return date otherwise you will not be allowed to board your flight to Grenada. A proof of citizenship bearing a photograph is acceptable from British, Canadian and American citizens. Please note that as mandated by the United States Department of Homeland Security, all travelers from the USA must provide a passport to enter or re-enter the USA on vacation or business travel. A visa is not required from citizens of the USA, Canada, UK and most European countries, British Commonwealth, most Caribbean countries, South Korea and Japan. Delta Air Lines operates a weekly non-stop service from Atlanta. Caribbean Airlines: Departs Toronto connecting through Trinidad. About June 1st, after we know when everyone is arriving in Grenada and departing from St. Lucia, we will be able to offer discounted ground transportation from the airport to your hotel and to the ship. We will also be able to offer discounted ground transportation from the ship to your hotel and to the airport. Our host hotel for this cruise is the Allamanda Beach Resort, located on the soft white sands of the beautiful Grand Anse Beach. This will be our central gathering spot and only a short walk down the beach to the Bon Voyage Party. There are other nearby hotels located on the beach to choose from and all are within walking distance of each other. For more information on these hotels, please click on the following links. To fully enjoy Grenada, I encourage you to arrive a day or two early to enjoy the local culture, history and explore the island by signing up for some of the more popular tours. SPECIAL OFFER: Shop online for your best hotel deal, then let Catamaran Concerts book your hotel rooms and receive a $20 credit towards purchases onboard the Mandalay. Our Bon Voyage will be held on Saturday, July 6th at Umbrella’s Beach Bar on Grand Anse Beach, just a short walk from our hotels. Plan to arrive about 6 PM, order dinner and drinks and about 7 PM, entertainment will be provided by Eric Stone. Later on in the night, Eric will join some local musicians and the fun will continue. The Post Cruise Party will also be held at Umbrella’s Beach Bar on Saturday night, July 13th, just grab a seat and something to eat about 6 PM and enjoy all the music and fun. About June 1st, after we know when everyone is arriving in Grenada, we will be able to offer discounts on many of the popular tours available in Grenada. I encourage everyone to arrive at least a day or two early and/or stay a day or two later so you can enjoy the local culture and history. With the weather being what it is and knowing how things work in the Caribbean, Travel Insurance is highly recommended for this cruise. Please visit www.squaremouth.com to select a Travel Insurance Company. If you fly into Grenada the day of our departure on the Mandalay, Sunday, July 7th, you will have plenty of time to travel from the airport to the ship, if you allow us to arrange your ground transportation. You may even have time for a leisurely drink and walk around the neighborhood to visit the local shops prior to boarding the Mandalay. If you fly into Grenada one or more days prior to our departure on the Mandalay, you will have time to check into your local hotel, get to know the local neighborhood and on Saturday, July 6th, attend the Bon Voyage Party on the beach with the rest of use. On the day of our departure, Sunday, July 7th, we can arrange a half day or full day tour of the island or other popular destination. Just check out of your hotel, throw your luggage in the van and at the end of the tour, you will be delivered directly to the ship by 5 PM. On our arrival back in Grenada on Saturday, July 13th, we can arrange a half day or full day tour of the island or other popular destination and then deliver you to the airport in time for you to catch your flight home. If you plan on staying in Grenada for an extra day or two, we can arrange for ground transportation to take you from the ship to your hotel. You will have plenty of time to catch a half day tour and attend the Post Cruise party on the beach. The following day, enjoy a half day or full day tour of the island or other popular destination and then deliver you to the airport in time for you to catch your flight home.